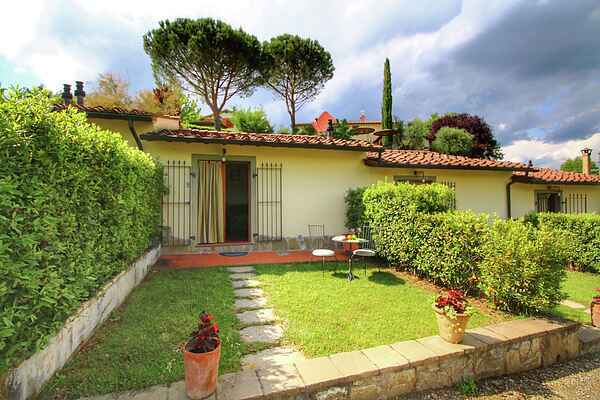 This holiday destination is situated in the heart of Tuscany in the hills around the Ambra valley. The agritourism consists of a group of old farms that have been completely renovated and furnished with several apartments. This home is located in a recently renovated building with a total of 6 small apartments, each of which has a private terrace. In the communal garden, there is a large swimming pool and mountain bikes are available. The agritourism produces the Chianti wine and Extra Virgin olive oil. If you would like, you can taste these local products. Its central location in Tuscany offers you the possibility to make interesting day trips to places such as Arezzo (25km), Siena (35km), Firenze (55km) and San Gimignano (70km). Also, you can easily plan a day at the seaside, which is 80 km away. The home is simply and modernly furnished. From the garden, you have access to the living room from which you can reach the open kitchen and bedroom via two steps. Details: A children's bed is available on request.